Greetings from your guest editor. The real Mormoncartoonist (Arie) is on vacation this week, visiting the Magic Kingdom and, no doubt, receiving inspiration on a whole new batch of comics on the theme of "dragging lots of kids around crowded amusement parks." While he's on sabbatical he has turned over the control of his blog to me (since he could find nobody with any talent who'd do it on short notice). This may not be such a good idea. Giving me the passwords to his blog is a little like handing your Ferrari keys to your 16-year-old daughter--it's bound to end badly. Thankfully, he passed along a set of cartoons for me to choose from, so you don't have to put up with my poorly-penned stick figures and humorless captions. A few years ago I had a General Authority tell me that the Church headquarters receives a couple dozen letters a year from wealthy members who request a calling as a mission president. "Needless to say," he went on, "none of them ever get picked." It's a good thing that the ward doesn't take applications for callings--you'd see people lining up for "ward greeter" and "that dude that walks up and down the aisle counting people" and no one applying for scoutmaster, bishop, elder's quorum president, or (of course) anything remotely associated with the nursery. Still, it can't hurt to "aspire" to someday escape the nursery and rise to the calling of "Relief-Society-Table-Decorating Person." Eric, I think the best calling would be 2nd Councilor in the Sunday School Presidency where you get to be the guy wandering around the halls making sure no one else is wandering around the halls. I'm honored that I finally made it into one of your comics, Arie! Although it says "Lawson", it has to be for Marc since it also says "Elders Quorum" something and it's partially covered by the guy in the comic. Still, I'll take what I can get. Eric, nice job. Maybe I'll start a blog and you can manage it for me since you're so good at it. 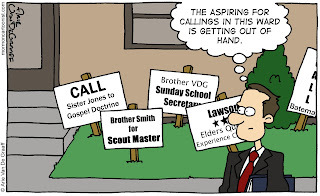 This cartoon is funny because there are always moments when we seem to want a different calling, especially when we receive a new calling we have never done before.